Football season has arrived and with it comes many amazing things: cooler weather, pumpkin scented/flavored everything, and most importantly the mandate to eat guacamole every weekend. Now I know some of you are thinking that you only have to make fresh guacamole for the Super Bowl and that it is optional for the rest of the season. The problem with this line of thinking is the limited choices in guacamole you get to test out before the big game. When you make guacamole every game you can try out a bunch of recipes until you discover the perfect guacamole for you by taking a little bit of what you love from each one. 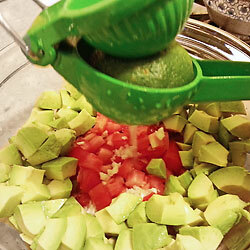 Below are my favorite guacamole recipes to help you get started. 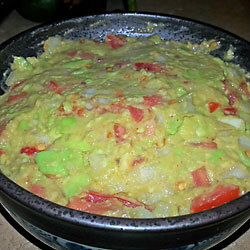 The first one is a more classic guacamole. It does have cumin and cayenne in it which gives it a little bit of flair. I personally love it because the cayenne adds a bit of kick in every bite, not just the ones where you bite into a piece of jalapeno, and the cumin works very well with the flavors in guacamole. I like to eat this straight with chips (really anything that can be used as a vehicle to get the guacamole to my mouth) but the spices in it also pair beautifully with the flavors in a fish taco. 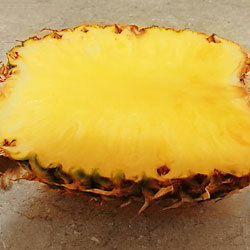 The second recipe is fresh and sweet and tangy from the addition of the pineapple. It is a bright burst of flavor that makes you want to put it on everything…and I do. The contrast of the sweet pineapple and the spicy jalapeno is a perfect flavor combination. I can literally not make enough of this stuff. The cumin and cayenne in this recipe give it a bit more kick throughout. 1. 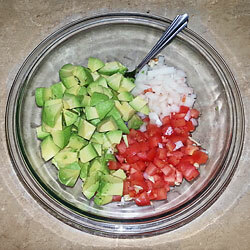 Place the onion, jalapeno, tomatoes, and garlic in a large bowl. 2. 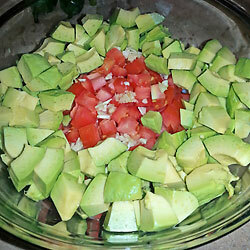 Chop the avocado into slightly smaller pieces and add to the bowl. 3. Add the lime juice, salt, cumin and cayenne. 4. Take a potato masher and mash everything together making sure to evenly distribute the spices. 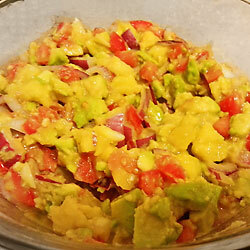 I like to mash it all together as it makes for a chunkier guacamole and I prefer that. 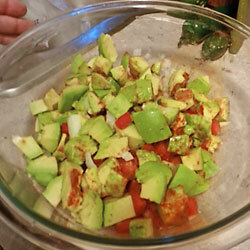 If you like a creamier guacamole with less lumps than mash the avocados with the lime juice and spices and then mix in the chopped veggies. 5. Lastly, stir in the chopped cilantro and serve. I will note that this guacamole does taste a little better if you give it an hour or so to sit and blend flavors but I usually can’t wait and dive right in. Recipe courtesy of Alton Brown on the food network website. 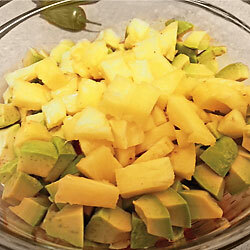 The tart freshness of the pineapple is the perfect complement to the creamy avocados. 1. 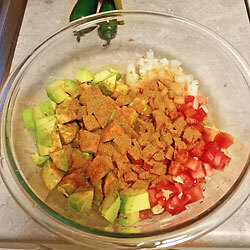 In a large bowl combine avocado, onion, tomatoes, and jalapeno. 3. Add the lime juice. 4. Use a potato masher to mash everything together. Again if you like it creamier rather than chunkier mash the avocado with the lime juice first and then mix everything else in. After mashing, add in cilantro. Your guacamole is done! 6. 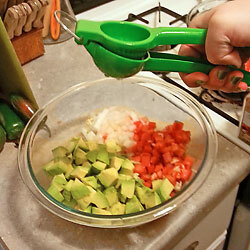 I used the cut off part for the pineapple that goes into the guacamole. Next hollow out the half with the stem. I used a combination of a paring knife and (surprisingly!) my ice cream scoop. 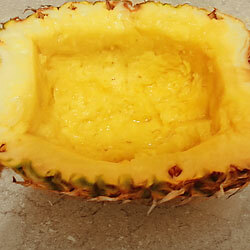 I have one with the sharp edges and the square points so it cut through the pineapple beautifully however a knife alone or even a melon baller should work just fine. 7. 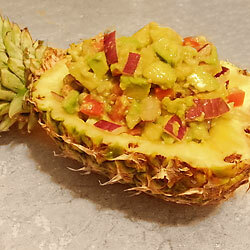 Scoop guacamole into hollowed out pineapple and be really impressed with how cool that looks. Then proceed to devour it.